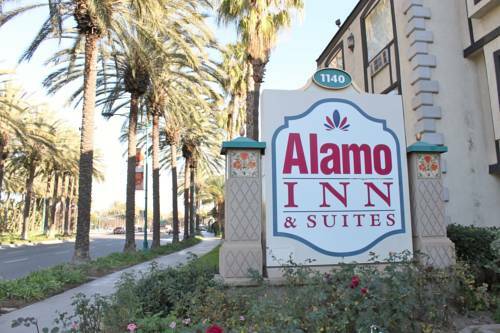 At Alamo Inn and Suitesand we invite you to be our guest. Our professional staff offers friendly attentive service. Conveniently located just one block away from the Disneyland Resort and Anaheim Convention Center. At the Alamo Inn and Suites you will find 86 spaciousand affordable and comfortable accommodations to you and your family. After a fun day at Disneyland or after a long day at Anaheim Convention Centerand our guest can relax in our outdoor pool and indoor spa. Our hotel is also within a few minutes drive to others great southerns California attractions and beaches. Guest rooms feature full cable with HBO and ESPNand AM/FM radioandalarm clockand direct dial phonesand telephone with voice mailand tub and showerand microwave and refrigerator available. Guest services include laundry facilityand free parkingand complimentary continental breakfastandtour availableand shuttle to Disneyland Resort and Anaheim Convention Center fee. Full payment requiered upon booking Reservation needs to be pre-paid upon booking if card transaction declines reservation will be cancelled. 72 hours prior to schedule arrival. Cancellation fee 1 night room and tax.